This Saturday, January 27th 2018, marks International Holocaust Remembrance Day. To honor the day this year, the World Jewish Congress has launched a campaign calling upon individuals and groups around the world to take and post photographs of themselves with the hashtag #WeRemember. These photographs are being live streamed this weekend as they are received on social media. 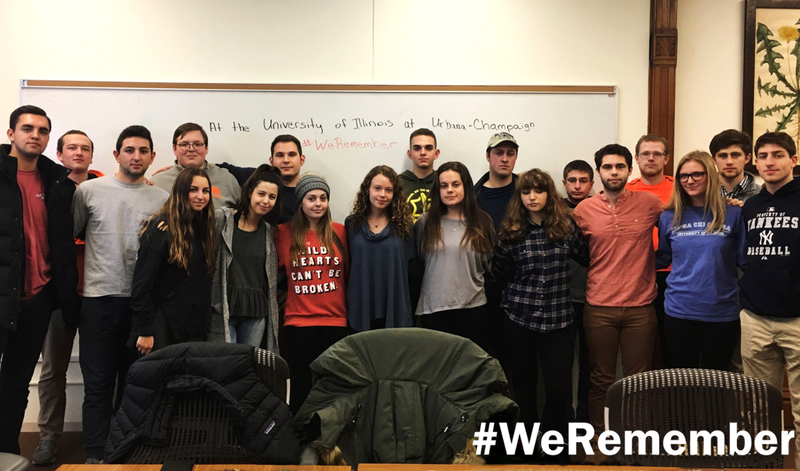 At IlliniPAC, we are joining this global movement pledging that #WeRemember the lessons of the Holocaust. We acknowledge the realities of international genocides that have occurred in the years since and strive to live up to a reality where Never Again is not just an expression. As students of the University of Illinois at Urbana-Champaign, we recognize the profound duty we have, as members of the last generation that will interact directly with the survivors of the Holocaust, to work every day towards this future. I am proud to be a part of a community that takes the lesson of #WeRemember to heart – one would think that the lessons learned from the Holocaust would have been enough to instill in the minds of the generations that have followed a commitment to ending genocide, yet this is not the reality of the world today. It is for my generation now to commit to a future where we can ensure that #NeverAgain will an atrocity such as these befall us.